Ever since we introduced the world to PongCrazy (our quirky take on ping pong), we’ve been dying to pimp up our tables ‘UV style’! So very recently we set to work on a new version that would glow all sorts of weird and wonderful colours in a dark room, under a black light, with the aim of confusing the hell out of people attempting to play. Sound like a good plan..? We thought so! So after all the prep-work it was great to be booked to bring our 3 UV tables and lighting down to Emmanuel College for their all-night, astronomy-themed May Ball and let the students of Cambridge loose on our brand new creation. The room was a hive of activity from the off. Our aptly named ‘Constellation’ table saw participants attempt to beat their opponent whilst avoiding the imaginary stars. ‘Sunbeam’ stunned players with a pulsating orange glow from the table, as well as from the specially adapted bats and balls. And, last but not least, our ‘Skew-V’ table’s diagonal stripes and slanted playing surface served to beguile and bewilder the masses. We were delighted with the success of the evening. Hundreds of students spent hours competing against each other for the coveted crown of best glow-in-the-dark ping pong player, all the while wearing the fancy dress glasses and headbands that we dished out! Our host and organiser Emma Meads commented – “We thought it looked fantastic and have only heard great reviews! The large queues were testament to that too’”. 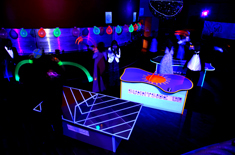 What better way to spice up an evening’s entertainment than by hosting a game of UV ping pong. If you would like to hire our activity for your next event, speak to a member of our team and we’ll be happy to help. All you need is the space – we’ll do the rest!